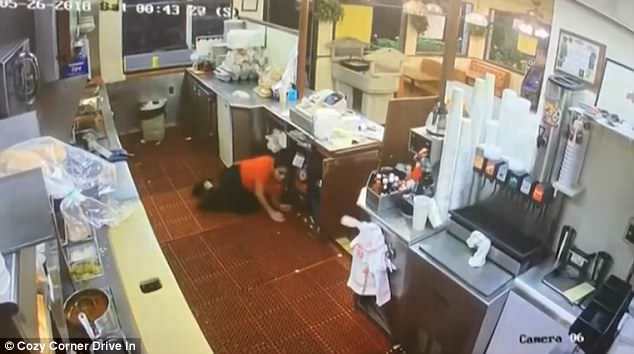 A robbery suspect was shot as he tried to rob a fast food joint by a man who fired through the drive-through window. The balaclava-clad man was seen on security cameras demanding cash from Cozy Corner Drive-In in Santa Ana early on Saturday night. He had his hand inside his puffy jacket like he was carrying a gun to get workers to comply when several shots suddenly rang out. The 60-year-old alleged robbed was hit twice in the torso and turned and ran with the $274 he stole, but only made it to just outside the shop where he collapsed and was arrested when police arrived. 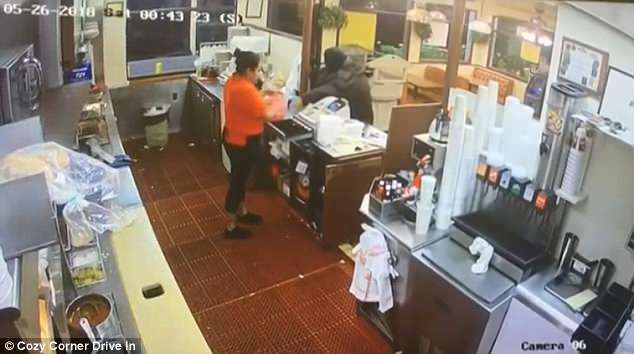 Bullets went through the window, wooden counter, drinks machine, and even the register, missing staff by inches. The shooter drove off in a silver sedan and is being hunted by police for assault with a deadly weapon. Police arrested the robbery suspect, who was rushed to hospital to be treated for gunshot wounds where he would eventually be charged. Cozy Corner manager Francisco Reyno said he was happy no one was injured and the stolen money was immediately recovered. The outlet was open for business that afternoon with bullet holes still obviously present and staff shaken by the incident.